MyGreatRecipes Introduces the Most Exciting New Updates Yet! Being aware of how much people rely on their phones and laptops in every segment of life, even in the kitchen, MyGreatRecipes is constantly working out new ways to satisfy its users’ needs. Our personal devices are more than just digital cookbooks, and for that reason, the platform is presenting new, exciting updates that will keep you organized, efficient and, most importantly, relaxed during the whole cooking experience. MyGreatRecipes knows that learning to cook can be a challenging task, that is why simplicity has always been an imperative. The website and app simplify the task for both home cooks and pro chefs by displaying the recipes in a tile interface, accompanied by mouth-watering food photos and step-by-step instructions. It is safe to say that MyGreatRecipes is a combination of digital cookbook and social network, where users can search, save and share recipes sourced from different sites. Users can create custom profiles, follow fellow cooks, as well as celebrity bloggers who use the platform, or upload their own creations for others to enjoy and much more! Now, all the best aspects of platform come upgraded in a new, more attractive layout. However, the main reason for changing the way information is presented was not just appearance. Knowing that users are leading busy and hasty lives, creators were driven by the desire to provide speed and convenience. 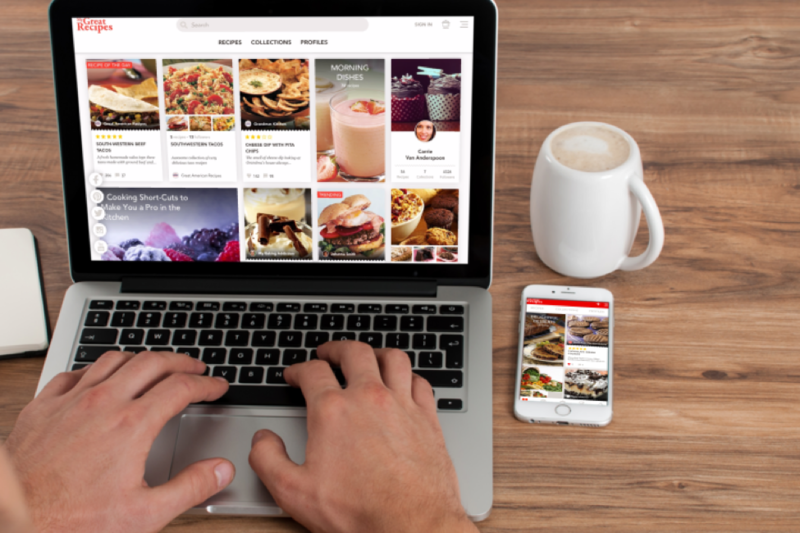 The website and app now deliver a rich serving of extra content in the form recipe collections, user profiles, and blog. The blog is the most recent addition to the MyGreatRecipes family, constructed to offer helpful information on various topics, including food hacks, tips and tricks, recipes, healthy ingredients, suggestions for special occasions and more, with a sole purpose to make cooking a fun and exciting experience! As mentioned before, presentation is of utmost importance in MyGreatRecipes, but its greatest advantage is its smart search engine, which is now even more powerful. The search and navigation algorithms provide a library of over 100.000 recipes, but instead of listing through all the recipes, you can browse through categories sorted to accommodate different diet restrictions and tastes. To further help you, the platform offers tips and tricks that follow the recipes, giving dessert and side dish suggestions, as well as ingredient substitutes that will help you tailor your favorite recipes to your specific needs, be it food allergies, vegan-friendly foods, etc. MyGreatRecipes editors know that preparing new, interesting meals every day can be a challenge. For that reason, they have introduced two interesting novelties. Once you enter the site/app you will be welcomed by ‘Trending recipes’ and ‘Recipe of the day’. Instead of going through dozens of recipes before you choose, MyGreatRecipes does the search for you, choosing the best and most popular meals to inspire you! The editors offer another convenient addition – recommendations based on time of day, designed to help you come up with meals for your daily menu in no time, regardless of whether you are cooking for your family or preparing for a special occasion. Go to our website MyGreatRecipes or download the app for free and experience the new way of cooking today!